Many standard items of miniature and dolls' house furniture have dismal levels of finish. Learn how to spot the problems and rework pieces to turn them into one of a kind miniature treasures using these simple techniques. 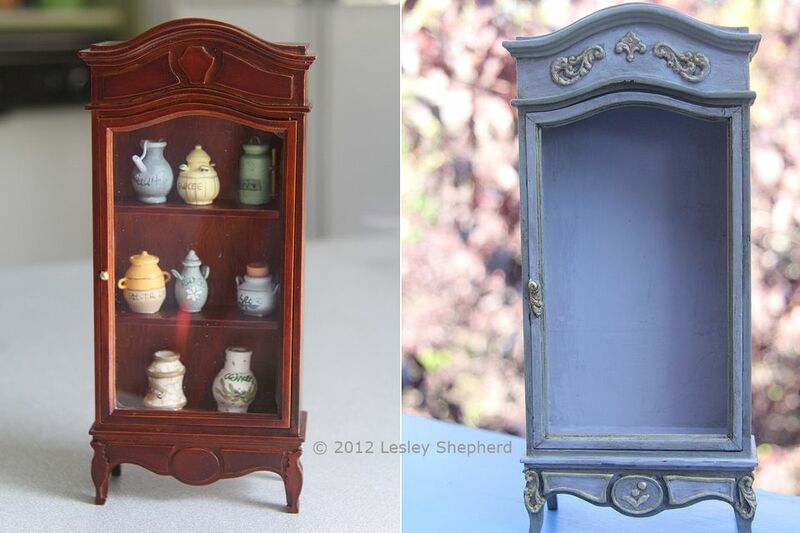 The piece shown here on the left is a standard Asian made dollhouse cabinet, with a few interesting details, fine molding around the door, and an arched front. Sadly it suffers from poor glue joins awkward add-ons and a finish that obscures detail. With a few easy steps the cabinet was transformed to the version on the right of the photo. We used simple details cast from artist's gesso along with two colors of Annie Sloan Chalk Paint ™, furniture wax (light and dark) and a gilding made from a clear acrylic finish and Jacquard Pearl Ex Pigments. The finished piece can be proudly displayed in a higher quality dolls house or used to hold trinkets. (At a later date we'll show you how to modify it for displaying earrings). Although we set this tutorial up to show traditional finishing styles for this cabinet, you could equally adapt the techniques to add bones and skulls for a Halloween cabinet or decorate the cabinet for any other seasonal setting. The same techniques outlined here will work for many projects. A few minutes spent exploring the pages of this tutorial will give you many ideas for adapting and reworking broken, poorly finished or unfinished miniature furniture to your own unique styles. The techniques work for all kinds of small-scale craft projects, not just furniture for a dolls house. The cabinet shown on this page is in its original state as we purchased it from a dollhouse supplier. It has a good basic shape, with the curved top and door suggesting French style, but the add-on details are poorly shaped and fitted, and there are lots of glue joins visible. The piece is a good size for many different displays, including full-sized jewelry or small collectibles. In its current state, it has clunky fixed wooden shelves with odd 'jar like' miniatures made from wood and wire, a scratched plastic window in the opening door. It is not a piece that would inspire any type of collection but it has some fine detail moldings around the door frame, and the curved front pieces are reasonably well balanced with the door shape, although slightly out of alignment. If you want to choose a piece to finish for a particular project, look for a shape with the correct lines for your project. Do you want straight modern edges? Soft curves? or particular types of trim? The fewer things you need to change to suit your style, the better. Aside from the obvious clunky contents, this piece of miniature furniture has a few flaws which will need to be addressed before it can shine. In the photo, we've circled some of the more obvious things which are easy to notice. Check your refinishing candidates for similar issues so you will know how to eliminate the worst offenders. On the bottom left, you can see where the side of the cabinet wasn't properly sanded to meet the top, leaving a large uneven gap in the corner. On the bottom right there is a small breakage on the corner of the shelf which will need to be repaired if we want to use the shelves again. Simple furniture can often be adapted from basic pieces by adding trims. Notice how this display cabinet is basically the simple armoir project with a single window door instead of double wood doors. The legs of this cabinet are shaped and added to the base as if it was a small table, with the legs cut two-dimensionally from a piece of wood which creates the curve across the base of the cabinet front. The front has been trimmed with a curved top door, matching a curved eyebrow trim, and a similar curve cut on the top of the cabinet front facing. This isn't a difficult piece to build. Fortunately, most pieces of mass-produced dollhouse scale furniture made in recent times use glues which are easy to remove. This cabinet had several areas of hard, clear, shiny glue in smoothly edged puddles emerging from behind the trims. The 'jars' glued to the shelves appeared to use the same glue. Shiny puddles of glue often mean a hot melt glue was used to join the parts. A careful application of heat from an embossing gun with a bit of pressure applied at the edges using a long polymer clay blade showed that hot melt glue had been used to glue objects to the shelves. We tried the glued objects on the shelves first, as they won't be used for this refinishing project, and their loss wouldn't be mourned. The shelves are slightly out of scale, so if they don't survive the glue removing experiment, they can easily be replaced. A hair dryer will also often selectively melt hot melt glues. If the glues wouldn't dissolve with heat, our next step is to try rubbing alcohol (isopropanol) on a cotton bud, and if that doesn't work either, try acetone (nail polish remover) on a cotton bud. Use any of these methods only under well-ventilated conditions! If your piece has windows or doors with glazing, you can get a better finish if you remove the clear glazing before you begin to sand or repaint. Our cabinet had an acrylic window glued into the frame using hot melt glue. There were noticeably large blobs at the base of the window. We used a narrow polymer clay blade to cut the hot melt glue, then ran the blade under the glazing panel on the back of the door to remove the window. We couldn't use the heat gun or we would have melted or warped the window. If the door had been set into a channel we might have had to take the door apart, but this is not a particularly well-built piece of furniture! If it is difficult to remove windows or clear door glazing, try to mask off the windows and doors with paper and masking tape to protect them while you refinish your piece. If you need to refinish scratched plastic or acrylic glazing, use a set of automotive finishing pads like the micro mesh sanding pads which will take most types of plastic back to a clear state. When you have dealt with obvious flaws its time to determine how best to redesign or modify a piece of miniature furniture. A careful look at our subject led me to notice the curve of the top was out of balance on one side, a flaw easily remedied with sanding. In the photo on this page, you can see what we decided to leave at this stage. We removed the side trims at the top as they were poorly fitted and looked wrong for the piece. Once they were gone, it became more obvious that the 'shield' panel in the center needs to be refiled or sanded to even out the shape. We eventually decided to dump this piece completely. Odd panels on the fronts of the legs were also removed as they didn't 'read' as belonging to any particular furniture period. The panels on the bottom, although a bit clunky, we decided to leave so we could show you a few easy modifications. Notice that although we've sanded away glue, we haven't removed the original finish except where it was badly applied. We're going to be using a type of paint on this cabinet which doesn't need surface preparation other than simple cleaning, a real time saver. To refine your refinishing project, choose trims which will take your basic piece of miniature furniture closer towards a recognizable period. By substituting decorative trims for the odd wooden cut-outs which were on our piece of furniture we can bring the piece closer to a true furniture style. It doesn't take much. French miniaturists often use small Dresden paper trims especially the tiny daisies, to mimic the flowers found on classic French furniture designs. You can use outline stickers, elaborate metal scrapbook corners or jewelry findings, punched paper shapes, or plaster or gesso detailing cast from simple molds. The same materials will work for nontraditional furniture embellishments as well. Embossed paper designs from baby cards for nursery furniture, stick on letters for monograms, a careful search of your stash will probably turn up lots of items which can be used to improve your basic piece of furniture. Even a simple row of glued on paper dots or twisted embroidery thread can add a period effect. To decorate our 'French' cabinet, we've decided to use a swirled flourish commonly carved or added as metal trim on this type of cabinet. We have a suitable candidate in our stash, a metal scrapbook corner embellishment. We could cut up the metal corner and glue it to our cabinet, but we'd rather make a simple one-sided silicone mold from two part silicone mold putty and cast a number of pieces of trim to adapt to use on different sections of the cabinet. Here you can see the mold made from our trim, along with the first gesso attempts cast in the mold. They obviously need to be made from a thicker layer of gesso. Cast from gesso, these trims can be glued flat to the cabinet, or dampened slightly and shaped gently over curves. Dried gesso is very strong, and makes up the 'carved' sections of most picture frame moldings. We plan to use our trims on the cabinet leg fronts, the door handle, and the upper cabinet trim. We've experimented by cutting the gesso cast into different sections to see which pieces can be best fitted on the cabinet. Gesso will dry to a slightly flexible trim which can be easily removed from a silicone mold. To form our trims, We use a glue spreader to fill the mold with a layer of gesso carefully laying the gesso into all part so the mold and tapping it lightly so bubbles will rise to the surface and not get trapped in the mold. Gesso shrinks as it dries. On the left of the photo, you can see the dried layer of gesso, while on the right side the second layer of gesso has been placed in the mold to strengthen it. Carefully build up two or three layers of gesso, leaving adequate time for each layer to dry thoroughly in the mold. Two to three layers of gesso should be fine. When the gesso is dry, carefully peel the shape out of the mold and used curved scissors and or dental tools to clean out any open areas or edges. Gesso is a wonderful artist's material. You can apply it by brush or through piping tubes/syringes to create shaped lines. You can gesso over items like ribbon bows or paper flowers to create hard 3D shapes. It carves and sands easily, and sticks easily to most materials. For the panels we left on the bottom of our miniature cabinet, we added simply raised edges by piping lines of gesso through a syringe onto the panels. Once dry, we sanded the edges and cleaned up the lines. As a design for the center round panel, we added our personal logo in gesso. You can see that detail on the final cabinet photos. As gesso is a base for painted surfaces, it can be finished to look like wood or stone, gilded or painted to suit your design. Here you can see where our gesso trims ended up. They were glued to the cabinet with PVA glue and checked for alignment with a ruler. After the trims are applied you can begin to experiment with finishes. We've begun with a layer of "Paloma" Chalk Paint ™ a soft mauve grey shade painted in the interior of the cabinet and behind the detailed trims. We're not sure how defined we want the trim yet, so we've applied a bit of gilding using clear acrylic finish mixed with Jacquard Pearl Ex Pigments. When applying paint to the trims, make sure you don't obscure the detail lines with thick globs of paint. The photo shows how well the paints cover the existing finishes. If you can, use a paint which covers in a single coat in a thin layer. This will help keep the detail of your piece crisp. Although we chose to use a 'painted' finish which is easily applied over any material, you could easily use one of the classic painted furniture finishes, or a faux mahogany, granite or marble finish on all or part of your miniature. To bring out the details on our cabinet, we chose to add a second paint color, Annie Sloan's French Linen, which is a dark taupe. The color pattern is planned based on the interior color, with the door trim giving a contrast. Once those lines are chosen, the other trim colors fall into place on the front of the cabinet. With the paint colors applied, it was time to add a finish layer of gilding around the inner edge of the door as well as on all the gesso trims. To protect the Chalk Paint finish and create a lovely sheen, it is best to apply a coat of soft furniture wax. Any furniture wax should work, we use a beeswax version scented with lavender, the same wax we polish our antique furniture with. The wax can be applied with a stiff stencil brush in a gentle circular motion to work it into all the tiny crevices. If you don't have a stencil brush, a clean old toothbrush will work just fine, especially if it is soft. Don't worry if the wax application removes some bits of the paint on the edges of the piece. If you are using a chalk type paint, it can be applied over wax or other coatings for touchups. When you have waxed the entire piece and given it five or ten minutes to set up, use a soft cloth (an old T-shirt, cheesecloth, or piece of fine sheeting) to rub out the wax, burnishing it to a soft sheen. If you like the finish, you could stop now on your miniature refinishing project, or use fine sandpaper or a glass fiber contact cleaning brush to gently remove some of the paint and wax to add realistic wear to your piece. If you want to add areas of wear, make sure more wear is close to the door handle and the edges of the door than on areas with decorative details. Look at examples of antique furniture which has not been refinished or aged, to see what a natural patina should look like. The next stage seems to cause fear in a lot of people, but if you have waxed your finish with regular furniture wax, applications of dark wax are easily adjusted. Applying a layer of dark wax brings out a higher contrast to show off delicate details in 'carved' areas of your miniature furniture. If you don't have a dark furniture wax, you can use soft wax shoe polish in a deep brown, or furniture 'scratch remover' pastes, which are mostly soft dark waxes. You can also usually add a bit of oil-based paint or oil pastel to a small amount of regular furniture polish to create a dark wax. Apply the dark wax the same way you applied the regular furniture wax, wiping off the excess wax as you go to keep it the shade you prefer. Provided you applied a layer of regular wax, a layer of dark wax can be controlled with a soft cloth after you apply it with a brush. Once you have the dark wax layer to your liking, leave the wax to set for ten minutes or so, then polish it gently with a soft cloth to get the finished sheen and patina. Even if you make a mess of areas you don't want to have dark wax on, you can easily correct the mistakes. See the next step. Cleaning up Dark Wax "Mistakes"
As the dark wax and light or 'clear' furniture waxes share the same solvent base, the 'clear' wax will act as a removal agent for any blobs of dark wax which find their way onto your refinishing project. The dark wax areas on the inside of this dollhouse cabinet came from dirty finger marks. A quick buff with a rag dipped in the light or clear furniture wax easily removed the dark wax and left the original clear finish behind. Once your dark wax has been rubbed and buffed, you can continue to distress or touch up the finish of your refinished cabinet. Chalk-based paints can be reapplied to areas of the piece, and wax effects can be made darker or lighter. When you have your cabinet finish the way you want it, set it aside and work on polishing and re-installing any windows or clear door parts. Take care not to apply to much glue when replacing clear panels. Depending on how you decide to use your cabinet, you may prefer to use any wooden shelves as templates and cut new, in scale shelving from clear acrylic/plastic. Clear plastic shelves can be supported at either end by thin strips of the same plastic glued into the cabinet. If you decide to use clear shelves, you might also want to consider drilling a hole in the top of the cabinet and inserting LED or small pot lights. Battery operated LED's can add a sparkle to the contents of a small display cabinet. As they give off little heat they can be used to light enclosed spaces. Have fun experimenting with different styles and finishes for miniature furniture pieces. A few carefully chosen details can make a world of difference.